Paul Desjardins was the big man in one of the brightest eras of University of Miami golf. His name blazed the links horizon many times during the early 1960's as he crashed through with glowing tournament triumphs time after time and helped make the Hurricanes almost unbeatable in dual meets and went on to become an All-American. While many of Desjardins' tournament triumphs were spread out evenly over three years at the University of Miami, perhaps his most sensational efforts came as a senior in the prestigious NCAA Classic and the UM International Tournament. In the latter, he not only defeated 350 of the top college golfers in the U.S. for the individual championship, he led UM to the team championship with a record breaking 278. Paul was also a quarter-finalist in the U.S. Amateur in 1962, and qualified for the U.S. Open in 1963. 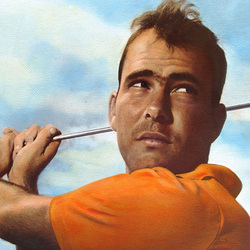 He also qualified for The Masters in 1963.